I can’t think of anything more refreshing than a glass of homemade lemonade on a hot summer day. At least, I didn’t think I could. Then my boyfriend’s mother told me about the parsley lemonade she enjoyed on a recent lunch date. What better way to make lemonade even more delightful than to add in a bunch or two of fresh herbs? And why didn’t I think of that? There was no doubt that parsley lemonade would be served at my next BBQ and truth be told, it’s been served at every one since as well. 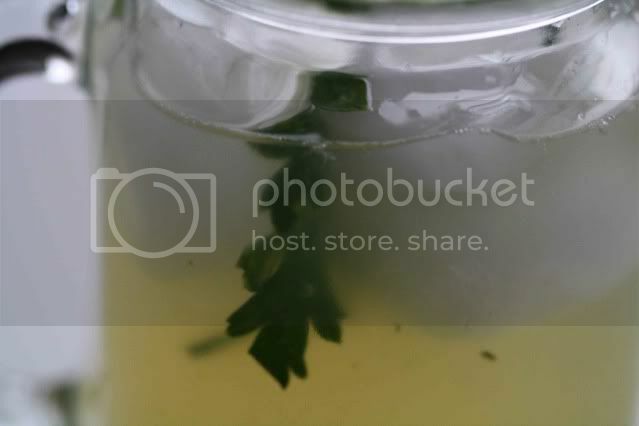 Rather than worry about everyone at the BBQ walking around with flecks of green, chopped parsley stuck in their teeth, I steeped the parsley in a simple syrup to infuse the flavor without leaving any parsley in the final drink. This kills two birds with one stone – you have your flavoring and sweetener in one mix. If you feel like stocking up on some new glassware, good old-fashioned mason jars make a great vessel for this drink. Sur la Table sells a great set with handles that are sturdy enough to have survived a number of our backyard BBQs. Remove large stems from the parsley and roughly chop. Place water and sugar in a saucepan over medium heat until sugar is dissolved, stirring occasionally. Once the sugar is dissolved, add the chopped parsley to the pan and let heat for one – two minutes more. Remove from heat, cover and set aside until cool and the parsley flavor is infused, about an hour. In the meantime, juice the lemons. When the simple syrup is cool, combine it with your lemon juice. You now have your concentrate. You can either mix the concentrate with water to taste and let your guests serve themselves, or keep the concentrate separate and let each guest decide if they would like to use sparkling or still water and mix each drink to taste. Garnish glasses with a sprig of parsley. *If desired, roll the lemons between your palm and the countertop to help release all of the juices before juicing. Oh wow, this looks so beautiful and refreshing! I agree, a tall glass of lemonade quenches the heat of the stickiest day! MMMMM,...I think that would immediately refresh me,...Yum! This looks beautiful. I've used lavender but never parsley in my lemonade. I'll have to try this. What a creative way to use fresh parsley! I have heard of basil lemonade, but never parsley... sounds refreshing and delicious! wow, what a particular recipe... looks very good! Yup, that sounds really, really good. BTW, I continue to make the buratta sundae to great acclaim and can't thank you enough! Wow. Herbs and lemonade, never would've guessed that. Can't wait to try. Thanks! Parsley infused lemonade sounds like a drink I’d enjoy (also Basil infused, yum). I’m the kind of girl who orders basil or lavender or saffron gelato. Thanks for the comment on my blog by the way! It was, indeed, a refreshing cake. Oh yes, this sounds good. Unfortunately in London summer seems to have left us and sent stair-rod rain and hail stones in its place. Next time I see a glimmer of sunshine though, I'm making this. I might try it with lemon verbena too. Gabriela - love lavendar ice cream and just made some at home for the first time. It will be on the site soon. Check back! Unconfidential - I'm so glad! The burrata sundae is the gift that keeps on giving. People are always blown away by it at parties. Licked - Love the lemon verbena idea. My plant is going crazy in the backyard so I may try that with the next round! I love homemade lemonaide! 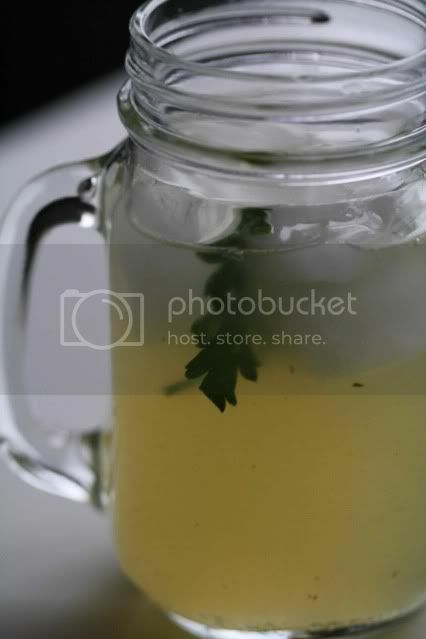 I like to add fresh mint to homemade lemonaide and iced tea, but I never thought to add fresh parsley...fabulous idea! I love it! Parsley is the PERFECT herb for this, because, IMO, no herb is cleaner and tasting, not even mint. Of course mint is lovely with lemonade. But I LOVE the idea of parsley, I can't wait to try it!!! Sounds very refreshing! I love lemonade but have never tried it with herbs! Parsley sounds like a great addition. I do basil lemonade sometimes, but hadn't thought of parsley. Sounds incredible! I have to admit, the sound of parsley lemonade is a bit strange but I'm intrigued- I'll have to give it a try. What an interesting twist! It sounds wonderfully refreshing! Oooh, this is interesting. I definitely need to try this! Sounds refreshing and delicious. There is a restaurant (The Ramos House Cafe) near me that sometimes serves cucumber water ... just sliced cucumbers in water. The cucumbers impart the most wonderful flavor into the water. I bet parsley does the same! I made homemade lemonade this weekend and have to admit that's it's much tastier than any mix. Ooh, I really like the idea of adding parsley, though! How fresh and pretty that cool mug of lemonade looks! This sounds perfect for a day like today! I keep meaning to try rosemary in lemonade, but I hadn't thought of using parsley before. Great idea to steep it in the simple syrup. This sounds perfectly lovely. I really enjoyed a risotto I had at Corkbar that was splashed with parsley-infused olive oil that gave all the flavor of parsley but without those nasty flecks that I always seem to get in my teeth! How original! That just sounds great. I would never have thought of it, but it is one of those things that when you do come across it you think, why of course! I usually use fresh mint but parsley is an interesting idea.